The original fire truck, known for its large water capacity. This engine is often the cornerstone of many departments while only carrying the essentials in rescue gear. Built on a Freightliner M2-106 Chassis, Roberts Creek’s Pumper Engine utilizes a Cummins ISL and an Allison EVS 3000 transmission which yields 350 horse power. Built on a Freightliner M2-112 Chassis, Pilot Mountain’s Pumper Engine utilizes a Cummins IS9 and an Allison EVS 3000 transmission which yields 450 horse power. Built on a Freightliner M2 106 Chassis, Sun Peaks’s Pumper Engine utilizes a Cummins L9 and an Allison EVS 3000 transmission which yields 330 horse power. Built on a Freightliner M2 106, White Fish’s Pumper Engine utilizes a Cummins L9 and an Allison EVS 3000 transmission which yields 330 horse power. Built on a Freightliner M2 Chassis, Lavington’s Pumper Engine utilizes a Cummins ISL9 and an Allison EVS 3000 transmission which yields 350 horse power. Built on a Freightliner M2 Chassis, Houston’s Pumper Engine utilizes a Cummins ISL9 and an Allison EVS 3000 transmission which yields 350 horse power. Built on a Freightliner M2 106 4-Door Chassis, Ucluelet’s Pumper Engine utilizes a Cummins ISL and an Allison EVS 3000 transmission which yields 350 horse power. 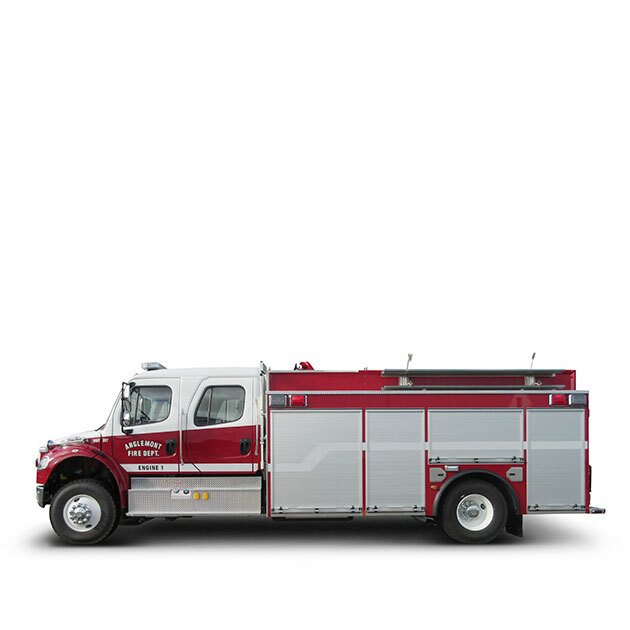 Built on a Freightliner M2 112 4-Door Chassis, Clearwater’s Pumper Engine utilizes a Cummins ISL and an Allison EVS 3000 transmission which yields 450 horse power. Built on a Spartan Metro Star X Chassis, Radium’s Pumper Engine utilizes a Cummins ISL and an Allison EVS 3000 transmission which yields 380 horse power. Built on a Spartan Metro Star X Chassis, Kelowna’s Pumper Engine utilizes a Cummins ISL and an Allison EVS 3000 transmission which yields 450 horse power. Built on a Freightliner M2 106 4-Door Chassis, Princeton’s Pumper Engine utilizes a Cummins ISL and an Allison EVS 3000 transmission which yields 350 horse power. Built on a Spartan Gladiator EMFD 10" Raised Roof Chassis, Kelowna’s Pumper Engine utilizes a Cummins ISX 12 and an Allison EVS 4000 transmission. 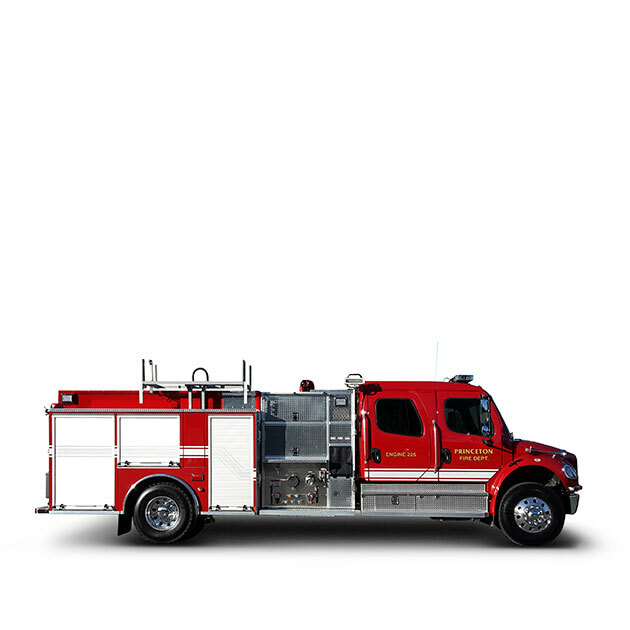 Built on a Freightliner M2 106 4 Door 4X4 Chassis, Anglemont’s Pumper Engine utilizes a Cummins ISL and an Allison EVS 3000 transmission which yields 350 horse power. Built on a Spartan Metro StarX MFD 10" Raised Roof Chassis, Sidney’s Pumper Engine utilizes a Cummins ISL 9 and an Allison EVS 3000 transmission which yields 450 horse power. Built on a Freightliner M2 106 4 Door Chassis, Ashcroft’s Pumper Engine utilizes a Cummins ISL and an Allison EVS 3000 transmission which yields 350 horse power. Built on a Freightliner M2 Chassis, Chetwynd’s Pumper Engine utilizes a Cummins ISL9 and an Allison EVS 3000 transmission which yields 350 horse power. Built on a Spartan Chassis, North Cedar’s Pumper Engine utilizes a Cummins ISL9 and an Allison EVS 3000 transmission which yields 380 horse power. Built on a Freightliner M2 Chassis, Blue River’s Pumper Engine utilizes a Cummins ISL9 and an Allison EVS 3000 transmission which yields 350 horse power. Built on a Freightliner M2 Chassis, Gillies Bay’s Pumper Engine utilizes a Cummins ISL9 and an Allison EVS 3000 transmission which yields 350 horse power.